Light rain from a post-tropical depression gave way to sunny skies at Geek Meet 2015 on Sunday, July 12 -- and the solar cookers at the Transition Oahu booth started cooking. Here is Transition Oahu board president Donna Lay taking out a batch of cookies from her Sun Oven. We served up a few dozen ginger cookies to Geek Meet participants while we shared information about solar cooking and Transition Oahu in general. The cardboard and foil cooker at right in the photo was made by TO board member David Atcheson and cooked a pot of seasoned root vegetables. Donna's Sun Oven reached a maximum temperature of 350° and Dave's (based on plans by Joe Radabaugh) got up to 320°. Transition Oahu wasn't the only tent featuring some solar cooking. Next door to us was Green Path Technologies, whose booth included a photovoltaic solar array laid out on the grass. The solar array charged a portable power source (a suitcase-sized battery system), which in turn was powering a rice cooker. Hats off to Geek Meet organizer Ryan Ozawa and the other volunteers who made this event possible. Geek Meet was billed as an "outdoor gathering of tech enthusiasts, scientists and science fiction fans, hackers, makers, creators, educators, and all-around creative and curious people. It's a family friendly affair in the fresh air to share your favorite tools and toys, learn new things, meet new people, and just relax and talk story with interesting people." It was all that and more. For more photos, check out the event on Facebook or search for #higeek on Twitter. We encourage you to try out solar cooking as a fun and carbon-free method that doesn't heat up your home. For inspiration, check out the Solar Cookers International wiki site. If you get into it, hope to see you with your cooker at Geek Meet 2016! August 1 – Xeriscape Garden "Unthirsty Plant Sale"
You'll also find these items in our calendar. November 27 (Thursday), 2 - 5 p.m. Still thinking about your Thanksgiving Day plans? If so, consider coming to the the Transition Oahu potluck. This year we'll be at ProtoHUB, the new co-working / innovation space in Kakaako. Arrive between 2-2:30 and listen to music and mingle while dishes are arranged for serving. We'll do a welcome & intro about 2:45 and start the potluck at 3. Transition Mapping: In addition to sharing food and conversation, we'll introduce a new project to literally put Transition and sharing-related resources on the map -- for example, CSA farms, eat-local restaurants, co-working locations, community kitchens, DIY educators, etc. Can you picture an app for that? We'd love your input and energies as we get the project rolling. Tune into HPR-2's Bytemarks Cafe on Wednesday, Nov. 19 at 5 p.m. (KIPO – 89.3 FM). David Atcheson of Transition Oahu will be on to discuss the project. Please bring your own own re-usable eating and serving ware to minimize waste. We'll have access to the kitchen at ProtoHUB for prepping/washing up. We are encouraging plant-based dishes and offerings. Transition Oahu and Positive Media Hawaii recently hosted a screening ofCowspiracy. This highly recommended film makes a persuasive case for the myriad of benefits that would result from moving to a plant-based diet, including greatly reduced greenhouse gas emissions, food sustainability, and better health for people, land, and water. Our potluck can be an event that, in its own small way, encourages our society in that direction. Do whatever works for you and we'll look forward to seeing you! The event is free but donations to help pay for the space will be gratefully accepted. On Facebook? You can RSVP here. Or contact usthrough our website (RSVP is optional but appreciated). Three briefings to choose from -- each will take place at the Hawaii State Capitol Auditorium, 415 S. Beretania Street (Lower Level) on Tuesday, October 14. Session 2 – 1 p.m. to 3 p.m. Complete information: See the PDF flyer. They will be important briefings covering recent scientific observations on planetary changes and the substantial, accelerating impacts they will have on climate and life here in the Hawaiian Islands. Our islands are more vulnerable to the effects of climate change than any other place in America. The public, policy makers and business leaders all need to understand the coming changes and what they portend. This is vital emergency-climate-preparedness information. Whether or not you think you are well informed about climate change, be prepared to be unprepared for what you will hear and see. The under-reported aspects of the causes, effects, risks and timing of climate change may significantly alter your worldview. Our situation can be mitigated if we take the warnings seriously. Since time is short until October 14th, as a service to your colleagues, family and friends, please forward the email you received and its attachments widely, post in high visibility areas at work and in public spaces, social media, and place on email lists you subscribe to. Three speakers will make presentations based upon research and on the ground observations of changes in the elements of Earth's ecosphere that will come to dominate our lives in the next couple of decades. Dr. Camilo Mora, University of Hawaii Associate Professor, lecturer and researcher with particular interests and expertise in Macroecology, Conservation Biology, and Biogeography. Stuart Scott, Deputy Director General of IESCO (International Ecological Safety Collaborative Organization), Chief Ecological Officer of NagaCorp, Ltd, international presenter and advisor and participant at UN climate negotiations. This briefing is vital input for policy makers in the State of Hawaii, and for Oahu, Hawaii's most densely populated island. ShareFest Honolulu is Saturday, Sept. 20 at UH Manoa! 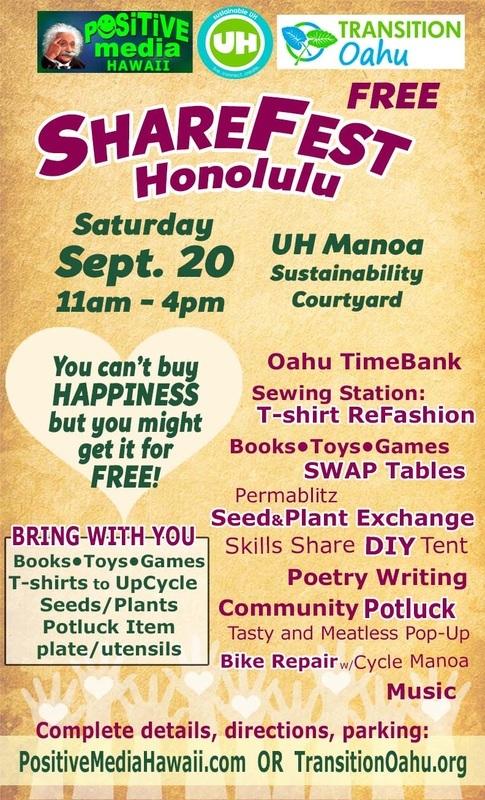 Join us in a fun and inspirational day of sharing at the UH Manoa Sustainability Courtyard. Exchange books and seeds, enjoy the community potluck, learn a new skill, write a poem, bring your bike by the repair station, upcycle a t-shirt, learn about sharing initiatives around town, and more! Children welcome -- Madame Butterfly will be there from 1:30-4 p.m.! Bring a book, toy, and/or game to swap! On Facebook? RSVP at our ShareFest event on Facebook and get late-breaking updates. Please help us spread the word by forwarding this email, posting the link to social media, and telling your friends and family. Thanks! 6:0﻿0 ﻿p.m. –﻿ ﻿8:﻿30 p.m. Transition Oahu potlucks are a chance to enjoy good food and conversation with Transition Oahu community members. Along with a dish to share, please bring your own plate and utensils to minimize waste. Cycling and cycling infrastructure like bike lanes, trails, and a bike share program will be significant component of a more convivial, less carbon-intensive Hawaii in the years ahead. We will have a brief guest presentation by Travis Counsell, project manager for Hawaii Bicycling League's Walk-Bike-Drive Education program, about HBL's work and what's ahead for Oahu cycling. Here are a few pictures from the Capitol on April 8, where we showed In Transition 2.0. (Thanks to Barbara Li for sharing her photos of the event!) Before the screening, attendees enjoyed pupus and visited info tables from participating organizations. After the screening we had a panel discussion. Thanks all for turning out! It was well attended and people responded enthusiastically to the projects showcased before, during, and after the film. See the event web page for links to the participating organizations and watching the film online. Our February e-newsetter includes many upcoming events such as films, conferences, and potlucks -- remember to save the date for April 8 at the Capitol for "Take Your Legislators to the Movies!" We also provide updates on bills in the legislature regarding food forests and industrial hemp. Students will participate in a real-life Regrarian** consultancy to develop a recently acquired 19-acre parcel in Lualualei Valley (West Oahu, Waianae area) into a viable agricultural enterprise which regenerates soils, restores biodiversity, and ethically stewards its natural resources. $50/person (rare opportunity; a fraction of the typical cost for similar workshops). Max 30 people, must RSVP to attend. *Darren Doherty is a 5th generation farmer, developer, author & trainer and has been involved in the design & development of over 1600, mostly broadacre projects across 5 continents in more than 45 countries, ranging from 1 million hectare cattle stations in Australia’s Kimberly region to 110,000 acre Estancia’s in Patagonia, EcoVillage developments in Tasmania to Public:Private R&D Agroforestry & Education Projects in Viet Nam, Novel AG Machinery development + Family Farms across the globe with a range of private, corporate, government & non-profit clients. ** 'Regrarian', a portmanteau of ‘Regenerative Agrarian’, is a term first coined by Darren in 2013 to describe those who are actively undertaking the serious & timely process of regenerating, restoring, rehabilitating, rehabitating, rekindling & rebooting production landscapes, be they urban or rural, across the world.